Protein: Is it Important, How Much Do You Need, And Where Can You Get It?! 10 years ago, one of the most common questions I received regarding performance, training and nutrition was in some way, shape or form involving protein. And today, one of the most common questions I receive is…wait for it…in some way, shape or form involving protein! So with that, I wanted to reach back into the files and update some of the amazing content I’ve written before (<— I may be just a little biased) to provide a quick, bullet point style overview about the main concepts of protein. Lets go over the role protein plays in a high performing body, the myths behind protein and its consumption, as well as make a few recommendations. – Protein is important, and you may even say that protein is the most important of all macronutrients (fat, carbohydrate, protein, water) when it comes to achieving your over health, fitness and performance goals. – While I would argue that all are equally important, protein definitely plays a key role in almost every bodily function including building and maintenance of structures (muscles anyone?! ), muscle contraction, immune system function, hormone production, nutrient transport, energy and more. So ya, IT IS IMPORTANT! – Without adequate protein, the body will breakdown stored protein (again, muscles anyone?!) in order to complete the functions previously mentioned…no good if you are trying to build a strong and high performing body. – NO!!! Protein alone will not make your muscles huge. You must apply a stimulus to the body (training) that breaks down the system and requires the body to adapt and grow stronger. Then, protein can be utilized to help repair and grow tissues, including muscle tissue. – NO!!! Protein alone will not incinerate fat and reveal you washboard abs. While protein is the most metabolically active macronutrient (it takes calories to breakdown and utilize protein vs carbs and fat it doesn’t to any significant degree), protein will only help you lose weight when you are in a caloric deficit. With that said, for many, replacing processed carbs with protein (less pasta and more chicken for example) will help you consume less overall calories as well as consume more high quality nutrients, which will aid in losing the midsection jiggle. – Protein is a nutrient, not a steroid. While it plays an important role in anabolism (the building of muscle and other structures), protein will not provide you will slabs of rock hard muscle without the hard work…sorry bro! – Ladies, protein will not make you gain tons of muscle (or make you grow a mustache), and neither will training heavy or intensely! So eat some steak, crush some weight and get off the damn elliptical! – There are many sources of protein which include animal based proteins (beef, chicken, etc. ), fish based protein (salmon, haddock, tuna, etc. ), dairy based proteins (milk, yogurt, whey, casein, etc. ), egg based protein and vegetable based protein (tofu, soy, protein, etc.) and protein can be found in nuts, seeds and legumes as well. – You can also use protein supplements such as protein powder. – Whey stands out as the most versatile protein powder, but is dairy based so if you are intolerant to dairy it can be a problem. – Casein is another dairy based protein and digests slower than whey making it a decent option when you know you are not going to be eating for a while (before bed, etc.). 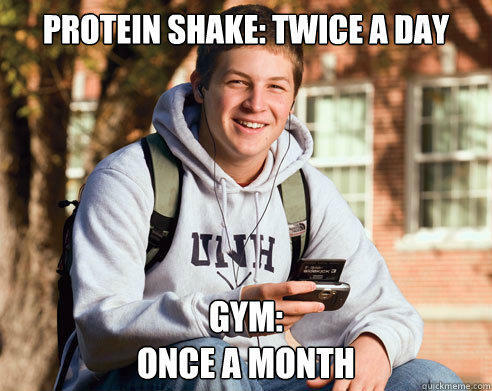 – Protein shakes, DUH!…check out this Protein Shake Construction Guide (your welcome!). And just make sure to wash out your shaker bottle! – Other than shakes, great ways to use protein powder include throwing some in oatmeal, cottage cheese or Greek yogurt, putting it on popcorn, flavoring coffee, making homemade protein bars and more. – *Protein powder is a supplement and should be used as so. Think of protein powder as an additional (and sometimes more convenient) way to positively augment your daily intake, not as the primary source! So there you have it, a short, a simple overview of protein along with a few tips. This does not even scratch the surface when it comes to protein, but hopefully you can see that protein is important, but should not be mistaken as the “magic sauce” (or powder…see what I did there), or demonized as something that just makes you big and bulky. The key is to make sure you get enough high quality protein and continue to work hard! If you found this helpful please send it along to you friends and family. Thanks! And for more specific help with your nutrition, training or both, shoot me a message on HERE.